A couple planning for an investment property in Austin ended up with a home that was too terrific to let go. 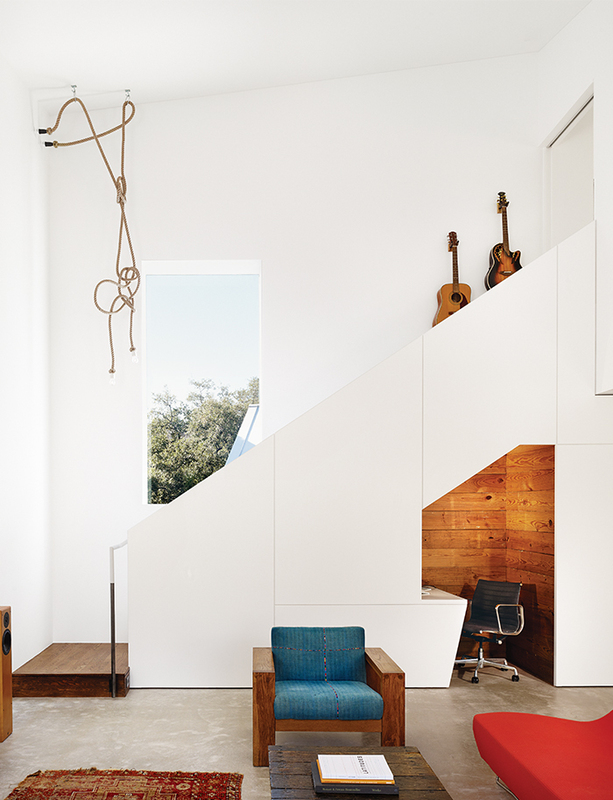 Sam Shah and Anne Suttles asked architect Kevin Alter to renovate their 1920s bungalow in Austin, Texas, and add an addition, which contains a living area downstairs and an office upstairs. They tucked an office nook under the stairs; the Eames chair is a hand-me-down from Shah’s father. Shah, Suttles, and their daughter, Tesla, use their outdoor space as an extra room. Near the pool is a seating area with Bistro chairs from Fermob. The bungalow before the renovation. The addition, which has cypress paneling and a metal roof, is united with the renovated 1920s bungalow via a glass pavilion. Alter integrated wood from the original bungalow into the kitchen and covered the island in Carrara marble. New appliances include a Wolf range, a Broan hood, and a Miele oven and refrigerator. The Fucsia pendant lights are by Achille Castiglioni for Flos, and the benches are from RAD Furniture. In the office, which is part of the addition, a collection of vintage posters hangs above a Cbox file cabinet and a table from Blu Dot used as a desk. The rug is a Photon. Located in the bungalow, the master bedroom was updated. On the CB2 Alpine bed are Anichini linens and a Pia Wallén Crux Blanket; Suttles and her mother made the throw pillows. The headboard was crafted from the house’s original wood. The couple repurposed old fruit crates as bedside tables and hung the Hugo Guinness prints. Featuring reclaimed wood from the original house, a single sliding door covers only half of the kitchen pantry. As the door slides, china and glassware are revealed on one side; the other side holds Anne’s design library and favored heirlooms. The sliding door follows a track installed in the concrete underfloor; the shelves are supported by recessed steel brackets, strong enough to hold the weight of a man—or a baby. An additional full-size pantry is located inside the laundry room, toward the original bungalow. The stairway chandelier is made from designer Christien Meindertsma’s flax-rope lamps for Thomas Eyck, which feature the same material as those used in Dutch shipping yards. At eight months pregnant, in anticipation of the new baby, Suttles mounted a ladder to arrange the rope, which her stepmother strategically sewed to achieve just the right shape. Doubling the footprint of their home and adding a pool could have placed Shah and Suttles on the wrong side of the city of Austin’s strict impervious cover rules, which set square-footage limits and are intended to protect local water quality. So they installed high-tech Eco-Priora pavestones in their driveway to help capture rainwater runoff. It’s not quite as fancy as the underground storage tank they sought at their first collaboration with Alterstudio, but the strategy allowed them to go green and stick to their design. Music man Sam Shah, a former A&R rep with Dave Matthews’s ATO Records, and multimedia designer Anne Suttles, a native Texan whose expertise ranges from floral displays to interiors, met at a party in Austin during SXSW 2004. But rather than music, the pair bonded over a shared appreciation for modern Dutch and Danish architecture. In short order, the couple were building a dream home together in Texas’s capital city. With the help of Kevin Alter—a dean of architecture at the University of Texas and founder of Alterstudio, an award-winning local firm—they constructed an ultragreen home out of recycled materials, loaded with eco-amenities. That house was recognized by AIA Austin, won a National Dream Home Award, and was featured in this magazine (see Dwell, October 2011). Inspired by this success, Shah, Suttles, and Alter agreed to reunite for the renovation of a second home, which would serve as an investment property for the couple. Before too long, the pair found a dilapidated 1920s bungalow in Austin’s Travis Heights neighborhood and set to work complementing the existing 1,000-square-foot structure with a cypress-clad 1,100-square-foot addition. But life rarely goes as planned. Shah and Suttles soon had a child on the way, and a direct offer—no broker—came their way for their beloved dreamhome. “It was good money, yes,” Suttles explains. “But it was more than that—with all the stress of being pregnant, I also wanted something that would be more private.” In the Travis Heights house, privacy was established, in part, by moving the entryway from the front of the bungalow to the back. A glassed-in box links the two structures: The original bungalow holds the family bedrooms and master bath, while the addition boasts an open-air kitchen and dining combination, Shah’s home office, and access to a landscaped yard and pool. The finished project, for which the architect drew his vision from Marcel Breuer’s binuclear house, feels just right for Shah, Suttles, and their two-year-old daughter, Tesla. Anne Suttles: I came to Austin for school—and then for 10 or 12 years was coming and going, coming and going. When we first met, we did the long-distance relationship thing. Around 2006, I gave in and moved to New York, but I brought him back. He had what was considered a super-nice apartment in Manhattan—a thousand square feet, a balcony, and a protected view—on East 49th Street. But I was not appreciative. To me, it was just a box in the sky. So, he said, if he was going to move to Texas, we needed a really badass house with a pool. Sam: There was huge significance to me, of being in New York forever and then coming here to build our dream home. I had lived my whole adult life in New York, 17 years. I needed an escape. I felt with the last house—and this house now—my house is one big vacation. The pool is a big part of that, having the outdoor space. I have everything. Anne: We never had a space that’s this spread out, even in the last house. Sam: The elements of light and all the glass were always important to us and will continue to be important. All the different viewing angles are dependent upon where you’re sitting in the house. Anne: I didn’t want to tear it [the original 1927 bungalow] down. I wanted the old and the new. We looked at houses to kind of remodel and add to, but it just didn’t happen. This was exactly what we were looking for, and, I think, to preserve it and share it, there’s a value to doing that the right way. Basically, we wanted this house to be fully updated, in terms of every last pipe and wire and foundation, but also to preserve the parts of it that make old houses special. The hardwood floors had been refinished only once since 1927, which is insane. We’ve closed off a couple things. We shifted everything so they would line up based on the restrictions for setbacks and whatnot and how we wanted to build this addition. The hallway wasn’t there. Originally, the hall was part of a bathroom, part of the kitchen, and part of the dining room. So, some things had to change. It just made more sense to have the private area up front. It helps that the front was raised up. It’s a really beautiful experience, being on the second floor looking into the tree canopy as opposed to being on the ground floor looking out on the street. It’s probably one of the more magical parts of this whole property. Sam: It’s such an unassuming house from the street. You don’t really get a sense of the configuration, let alone where the front door is located. I’m so grateful for this; everything has its place. Sam: I love how we kept the area where the old front door used to be. Anne: Our architects, Kevin Alter, Tim Whitehill, Ernesto Cragnolino, and their entire office, are crazy about details, probably to a fault, in that they could make a lot more money if they spent less time doing things so perfectly. There’s not one inch that hasn’t been spelled out, and I love working with someone that cares as much as I do about the details. I’m not in any way, shape, or form a builder. I’m not an architect. But I love creating spaces I would want to live in. I love collaborating with architects. I was thinking if I did live here, how would I want it to be? That’s how the space was designed. Sam: We’re very much influenced by Scandinavia. My mom is from Denmark, and I’ve spent many, many occasions there. I loved that place. We took a trip in 2010, went over to the Netherlands and Amsterdam. Then, Sweden. Anne: Collecting a lot of ideas. Sam: Walking up the driveway, you have this great contrast, and that’s the black-stained addition. It’s so unassuming, you don’t really know what you’re seeing. You don’t really understand what’s going on with this house until you’re inside. a stain, it doesn’t really affect it overall—it’s such an efficient building to begin with. Shah and Suttles, lovers of light, prefer to live without window shades but are still concerned about privacy. Working closely with local landscape master Mark Word, they planted mature bamboo and huisache trees along the property line to create shade and a private area near the pool.